Dahlias are generally propagated by dividing the root tubers. You can do this in the fall before you store them away for the winter or in the spring when you are ready to replant. Many gardeners prefer to divide dahlias in the spring because the eyes are more visible and the plants have survived the winter. Dahlias also have a tendency to develop more eyes during winter storage, which means more divisions later. Wait until the plants have been hit by frost and die back. Cut the top growth down to about 4 to 6 inches and leave the plant in the ground for 10 to 14 days to allow it to cure and prepare itself for winter and for the eyes to begin to develop. To lift the dahlias, begin digging about 1 foot away from the plant, loosening the soil. A shovel is generally better to use than a fork since it is easier to avoid stabbing tubers. 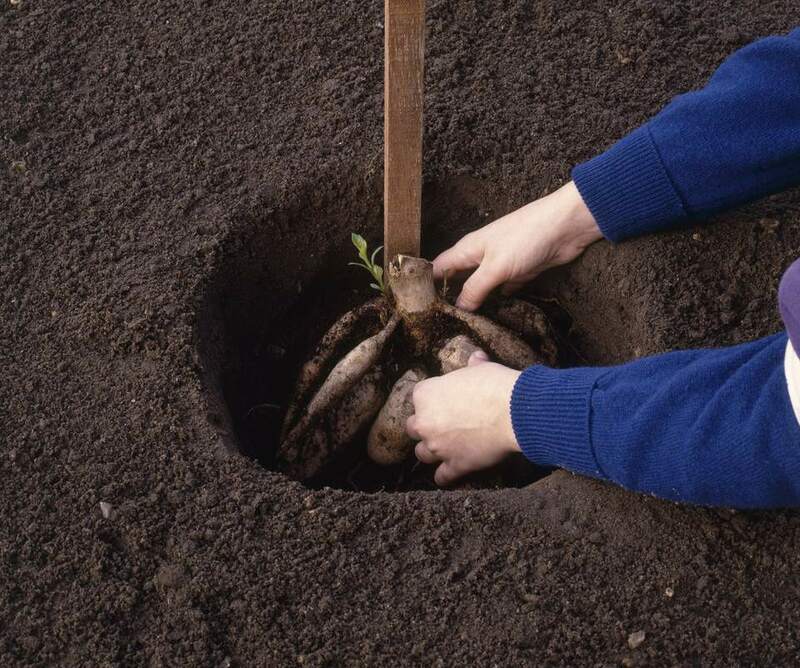 Once the soil is loosened, lift the plant out of the ground. The tubers have a tendency to snap off, so handle the plant gently. Gently shake and brush off the excess soil. If you are going to be dividing in the fall, you can hose off the remaining soil for a better view of the eyes. If you are going to divide in the spring, set the tubers somewhere cool and sheltered, so the remaining soil will dry out and fall off. Once you've removed the soil, you can cut the stems back to just above the crown and inspect for rot. Although a clump of dahlias looks like multiple fingers, you can't just separate the fingers and grow more plants. Each dahlia division needs to have at least one eye and a nice, fat tuber. The eyes are the white or pinkish dots on the tubers. They are the growing point, the place where the stem will come from next year. Dahlia eyes are all located around the base of the stem. The tubers growing off of tubers will not have eyes and will never grow into plants. They can be left on the plant for extra food or composted. The big, central tuber is the original that you planted in the spring. It might have another good year left in it, but many gardeners prefer to start with fresh divisions each year. A sharp knife is the best tool to use. It can get between the mass of tubers and will make a clean cut. Slice through the stem to make the divisions. Let the cut tubers dry somewhere cool, about 50 F, that is also dark and dry, for at least three days before you store them away. For more on storing them, read Over-Wintering Tender Bulbs.